Save Upto 50% Off On Shipping Costs! 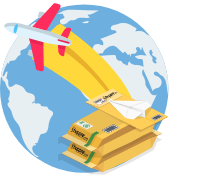 Have Some Documents to Send Abroad? Are you a student applying for higher studies abroad, or a potential candidate for a job position? Either ways, and for other broader range of reasons; if you have documents to send overseas, we're the best & the right choice. We ship to 220+ countries, and our shipping rates start from just *Rs.553. For you to courier documents of these natures safe and secure, we rely on only the most trusted courier services, and make it as affordable as possible. And, we go the extra mile by offering our fellow students a special discounted price too. What Else Do You Get Out of Our Offer? Store your goods here at our facility for 20 days for FREE! A quick delivery within 3-6 days! Schedule a Pickup from ANYWHERE in India, we'll come to your door in just 48 hours. Save up to 80% in shipping costs as we wait around for 20 days for all your package to reach us - for FREE, and repackage & ship them to your doorsteps as one! 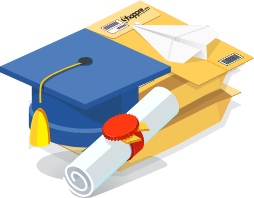 Documents will be deliver to your university. WES or other address within 3-5 working days after pickup.